New bishop: Carmelite Father Gregory Homeming will succeed Bishop Geoffrey Jarrett as Bishop of Lismore. LISMORE diocese is united in prayer for its new bishop Carmelite Father Gregory Homeming in the lead-up to his episcopal ordination on February 22. Pope Francis appointed Fr Homeming as the sixth Bishop of Lismore and accepted the resignation of Bishop Geoffrey Jarrett on December 20. Fr Homeming’s episcopal ordination will be held in St Carthage’s Cathedral, Lismore, at 7pm on February 22. Bishop Jarrett, who has been Bishop of Lismore for the past 15 years, will continue as apostolic administrator until then. Fr Homeming, 58, is regional vicar of the Discalced Carmelite Friars in Sydney. “I am humbled by the news,” he said when his appointment to Lismore was announced. “I knew that I had to say yes after the past 31 years as a friar. Fr Homeming said he had travelled to Lismore diocese many times as superior of the Discalced Carmelites visiting the Carmelite nuns at Goonellabah. Australian Catholic Bishops Conference president Archbishop Denis Hart said he joined the bishops of Australia “in rejoicing at the appointment of Fr Homeming as Bishop of Lismore”. “He brings wide experience as a retreat-giver, spiritual director and leader,” Archbishop Hart said. Bishop Jarrett said the clergy of the diocese “will remember (Fr Homeming) for the masterly retreat he gave us at Dorrigo in 2014”. “I am sure that you will keep the bishop-elect in your prayers during the time ahead as he prepares for the ministry of a successor of the Apostles and chief shepherd of our diocese which is now entrusted to him, and for his move to Lismore in the early months of the New Year,” Bishop Jarrett said in a message to the clergy, religious and faithful of the diocese. Born in Sydney on May 30, 1958, to an Australian Chinese family, Fr Homeming took degrees in Economics and Law at Sydney University and then worked as a lawyer in a Sydney law firm from 1981 to 1985. He joined the Discalced Carmelite order at the end of 1985 and made his first profession in 1987. He then studied for a Bachelor of Theology at Melbourne College of Divinity and for a Masters in Philosophy at the University of Melbourne. 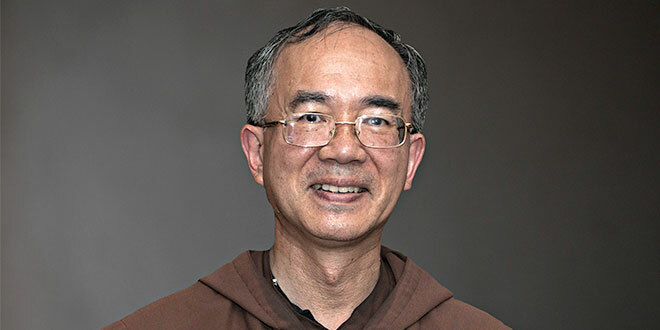 Fr Homeming was ordained in 1991, and as a Carmelite has served as a major superior, novice master, prior and retreat director.